Opening reception: Friday, May 18, 6-8 p.m.
"Pure abstract art has grown directly from the culture and refinement of mundane life; from culture—imperfect as it may be. It does not come directly from isolated philosophical or religious thinking of feeling. Fashion has a deep meaning: fashion is cultural expression. Although it may be an exteriorization, like the various forms of art, it nevertheless shows inner content." It is a particularly exciting time for McElheny, with three museum exhibitions displaying the diversity of subjects with which he is involved: currently on view through July 20 at Whitechapel Gallery, London is a year-long installation The Past is a Mirage I'd Left Far Behind, in part a meditation on abstraction in film throughout the twentieth century. Over the course of the next nine months two U.S. museums will present separate survey exhibitions of McElheny's work. Rather than present comprehensive surveys of McElheny's entire practice, each exhibition will describe the history of an idea within his oeuvre, with each museum taking on a different subject. The Institute of Contemporary Art, Boston will narrate the story of his projects involving astronomical cosmology and the infinite, while the Wexner Center for the Arts, Columbus will exhibit works that trace his obsession with writer Paul Scheerbart and the quest for modernist utopias. In advance of these significant exhibitions, the gallery is excited to present McElheny's newest body of work and in his third exhibition at the gallery. Some thoughts about the abstract body explores the connections between the history of visual abstraction and clothing/fashion created by artists over the past century. McElheny uses historical examples of artistic clothing and costume design as a starting point to present his own set of models for abstract form today. A series of sculptural assemblages, ethereal wall works, and a performance with attendant sculptures or props, present a diverse library of possible forms for the expression of images of an abstract physical and psychic body. Seen together, these works propose that our conceptions of and imaginations about the body's possible shape speak to the potential liberation—or confinement—contained in a subjective and non-universal approach to visual abstraction. Throughout the exhibition, McElheny suggests that abstraction seen through the lens of the body might be a path for returning to a conversation about the radical hopes and ideals originally associated with this mode of seeing. For those familiar with McElheny's work, the exhibition can be considered as both a new direction and a return to themes of about a dozen years ago. In 1999 and 2000 he exhibited a series of projects about Christian Dior and the creativity of factory workers, such as From An Historical Anecdote about Fashion, and in 2001 he staged The Metal Party—a participatory performance that reconstructed a famous party, some say rebellion, held at the Bauhaus in 1929—in which he provided all the participants a metallic costume. McElheny's recent forays into recovering or refocusing on historical figures who proposed a more subjective, less universal experience of abstraction also provide a backdrop for his newest work. In 2007, together with Iris Müller-Westermann, McElheny co-curated a groundbreaking display of the very first painter of geometric abstraction, the visionary Hilma af Klint, at the Moderna Museet in Stockholm, and in 2011 McElheny's highly researched interpretations of Blinky Palermo's "lost" wall paintings of 1970-1972 were exhibited at the Hessel Museum of Art at CCS Bard College as part of his large scale collaborative curatorial project with curator Lynne Cooke and CCS director Tom Eccles. 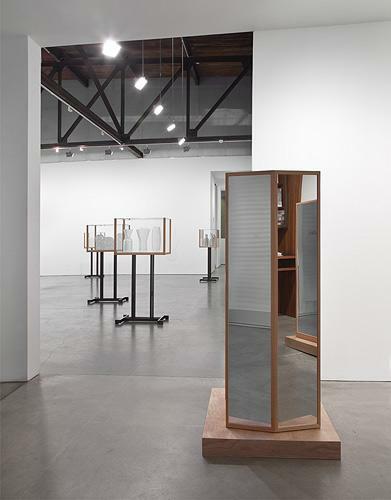 Upon entering the gallery, the viewer first encounters two wood and mirror sculptures, Walking Mirror 1 and Walking Mirror 2. Part sculpture, part costume or prop, its nylon shoulder straps suggest that they can be worn and a set of lines leads away from them and through the gallery. 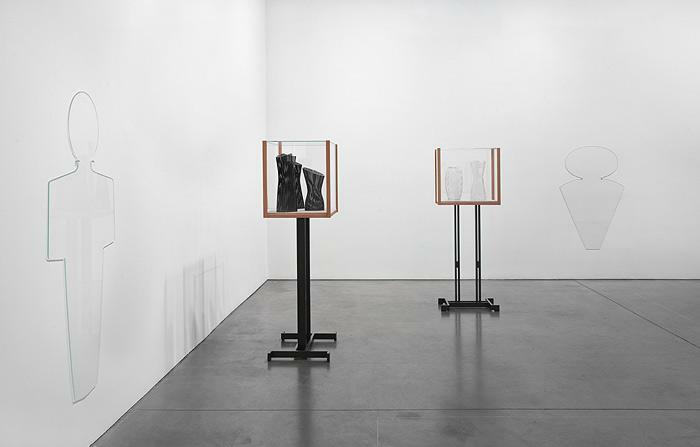 Structurally, they are not unlike sandwich boards but paradoxically they also cover the face, thereby abstracting and obscuring the wearer's body; when inhabited they reflect the viewer in place of the body of the performer. 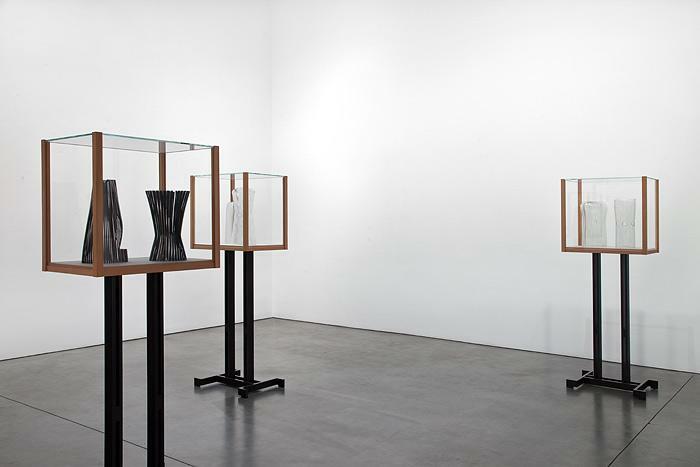 These works, when standing idle or when activated by a performer six times a week (Fridays and Saturdays at 2 and 4 pm and 5 pm either by actor/performer Austin Purnell or performer Lollo Romanski), set the tone for the way in which all of the works in the exhibition change subtly as the viewer—or the sculpture itself—moves around the gallery space. These "walking mirrors" are hybrid objects that make concrete the idea of the body as the site for abstraction, and provide an experience of how abstraction is both freeing and a kind of erasure. Filling the main part of the gallery are eight sculptures inspired in part by Carlo Scarpa's intricately designed vitrines specially made to display plaster models of the human figure in the Museo Canoviano in Passagno, Italy. Each of these Models for an Abstract Body has two legs and a "body" at chest height. 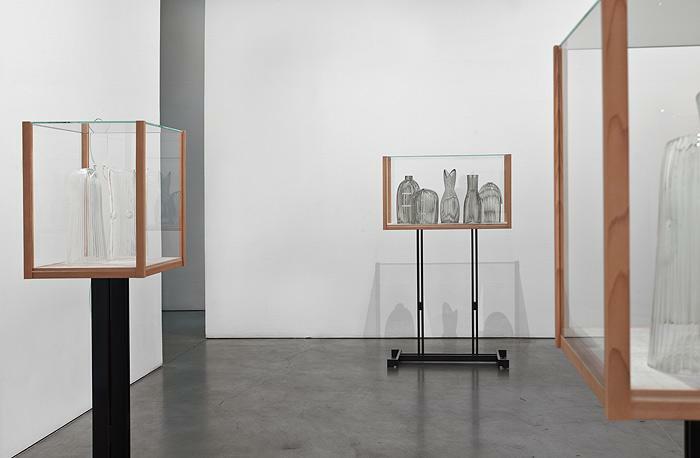 These anthropomorphic sculptures are constructed of cold-roll steel, with a glass box made of delicate, oiled cedar wood spines, a linen floor, and low iron glass. Visible on the interior of each sculpture are abstract glass forms blown and carved as quarter-scale interpretive "models." Each of these vaguely figurative shapes is based on a specific instance from the history of visionary abstract fashion and anti-fashion created by various artists (and two fashion designers). Elegantly colorless in white, grey, and black, the blown glass components of each assemblage call attention first and foremost to form, while at the same time they seem to move and change as one travels around the sculpture; this is due to striations and patterns that create a moiré or lens effect, both hiding and revealing an interior and subtly suggesting the unstable nature of cloth. As the titles of these sculptures note, each component or group of objects is an interpretation of designs for clothing, clothing as sculpture or costumes by such artists as Sonia Delaunay, Lucio Fontana, Kazimir Malevich, Liubov Popova, Alexander Rodchenko, Mimi Smith, Varvara Stepanova, Rosmarie Trockel, Konstantin Vialov, Franz Erhard Walther or designers André Courrèges and Alexander McQueen. Finally, there are a series of almost invisible shapes, made of transparent glass hung on the wall at the height of the viewer's body, each is inspired by the Bauhaus professor, painter and theater director, Oskar Schlemmer and his famous designs for costumes that turned the body into geometric abstractions. In Form for the abstract body (after Schlemmer) one can compare one's own body to these full-scale designs, shapes that only reveal the wall itself, but whose edges very gently glow around a surface that subtly reflects the viewer. Currently on view in London is McElheny's kaleidoscope-like film installation The Past Was A Mirage I'd Left Far Behind, a commission for Whitechapel Gallery, London, accompanied by a new illustrated catalogue. Forthcoming museum exhibitions include: Some Pictures of the Infinite curated by Helen Molesworth at the Institute for Contemporary Art, Boston (June 22 – September 23, 2012) and Towards a Light Club curated by Bill Horrigan at the Wexner Center for the Arts, Columbus (January 26 – April 7, 2013). (Each exhibition will be accompanied by a fully illustrated catalogue with newly commissioned texts; both are designed by Purtill Family Business and published by Hatje Cantz). 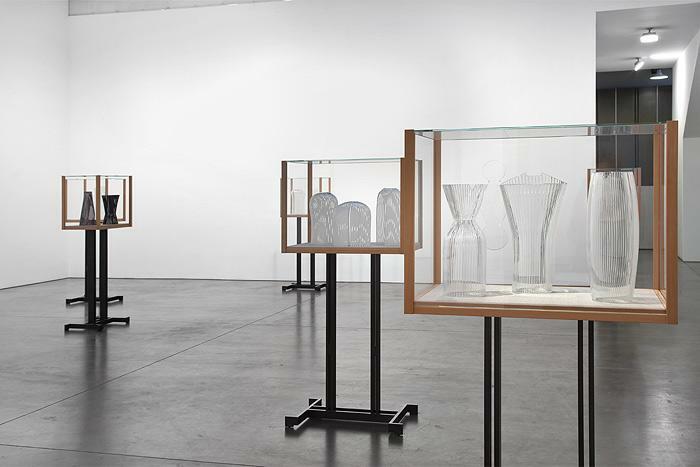 Other forthcoming exhibitions include: In the Spirit of Walser – Rodney Graham and Josiah McElheny, Donald Young Gallery, Chicago (September 2012); White Cube, London (November 2012); Vizcaya Museum & Gardens, Miami (Fall/Winter 2012). In June, Sternberg Press and CCS Bard will release McElheny's collaboration with Johanna Burton and Lynne Cooke Interiors, an extensive reader made in response to McElheny's curatorial project—which was itself a collaboration with Tom Eccles and Lynne Cooke— at the Hessel Museum of Art at CCS Bard in 2011.